A lot of people display the trappings of frontier life in Montana’s Swan Valley. Bud Moore has the actual traps. When his daughter Vicki has a chance to talk about them, and about the winter she spent trapping with her father a few years back, her eyes light up. But many people in the valley are suspicious of Vicki. She talks to them about managing their land to preserve the environment. She looks a little like a hippy. And most dangerous of all, she has lived most of her adult life in Paris. So when she asks the ranchers and the summer cabin owners to consider committing to a land management plan that will last for generations, naturally they are wary. 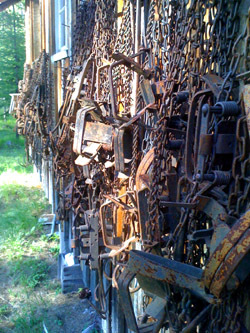 At her father’s mill last week, we came across a long wall of traps and got Vicki talking about how they worked. She could catch mink, beaver, even the reclusive wolverine. But of all the traps, the most fascinating was the one they had for coyotes. Land owners in the Swan Valley have a lot to worry about these days. With dramatic mountain ranges on each side and plenty of mountain lakes for fishing and swimming and boating, it’s little wonder that the property around them is no longer affordable for the average resident. Add in the invading noxious weeds, the bad economy, and the uncertainties of life, and the wisdom of developing and committing to a land management plan becomes pretty clear. But then there’s that hook. My wife eyes the new chicken house suspiciously. Julie: Is that supposed to be me? Me: Oh, no. That is Mrs. Henkeeper. 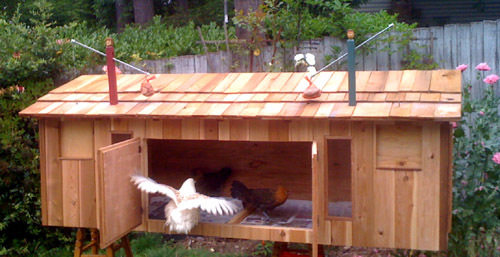 This newest henhouse with its cedar siding and custom-cut windows has considerably inflated the price of home-grown eggs. Mr. and Mrs. Henkeeper raise and lower special doors in the north and south egg rooms when you move their arms. Forrest will sometimes lay her eggs in Mrs. Henkeeper’s room when she can remember how to get into the house. Which is seldom. Our first chicken house, an A-frame with dormer, shelters the youngest chicks, Mildred and Alice. Every evening the older chickens try to sneak inside, and Forrest still lays eggs in it when she forgets how to climb the ladder into the new house. It is somewhat insulting that all the chickens prefer the first house, which I made in a rush. 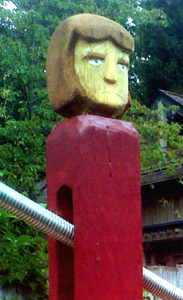 William: It doesn’t even look like a woman. I thought it was supposed to be Beethoven. The second chicken house, shaped like a barn, was built to shelter Juanita, Red, and Sylvia while they were still chicks. But the architect, whoever he was, spent so much time mulling over the design that the builder, whoever he was, did not finish until the chicks were no longer chicks. They crowded in anyway, until Forrest decided to leave her A-frame and join the barn chickens. She pushed her way in and went to sleep, awaking to find that the other chickens had fled to the A-frame. For weeks, Forrest the outcast waited vainly in the barn for the others to return. And then at last the third and biggest house was ready. Julie: That had better not be me. She looks mean. Me: Oh, no. That is Mrs. Henkeeper. And she’s not mean. She’s just very serious about keeping things in order. The third chicken house was sketched out on paper more than a month ago. During the time it took me to turn the rough sketch into an 8’x3′ henhouse, an entire 4000-square foot home on the lake below us caught fire, was razed and reconstructed. The barn now sits unused in the garden. Alice and Mildred sleep in the A-frame at night while the older chickens fall asleep outside its entrance, or on the roof of the third house. When they are asleep, we move the older hens into the new house, where they belong. At dawn, Sylvia and Red and Juanita run down the ladder. Forrest, who is blind in one eye, steps forward and tumbles off the side of the ladder, squawking as she hits the ground. The youngest chicks in their A-frame sleep in late. Like teenagers. Nick: Why doesn’t Mrs. Henkeeper have any pupils? Me: Go look into Mom’s eyes and then choose a color from the acrylic paints. One day soon all the chickens will know how to climb into their new henhouse at bedtime, and Mr. and Mrs. Henkeeper will move their arms every day to reveal 5-6 new eggs in various shades of brown and blue. And if Julie ever reads this blog, which she won’t, she should know that she is definitely not Mrs. Henkeeper. And also that Mrs. Henkeeper, although appearing to be a little stern, is greatly loved for her ability to keep order in a chaotic world. Mr. Henkeeper, on the other hand, mostly just moves his arms up and down. Forrest explores third house in transit. Henkeepers with their egg doors shut.